EL SEGUNDO, Calif.--(BUSINESS WIRE)--Just in time for the New Year, Beyond Meat® announces that TGI FridaysTM will add the revolutionary Beyond Burger® to the menu at their 450+ U.S. locations nationwide. 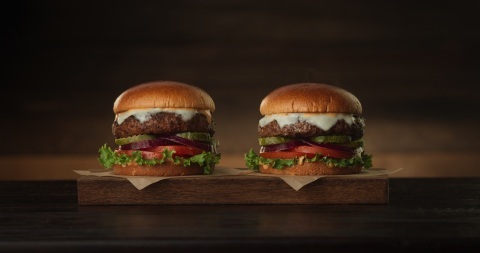 The addition of The Beyond Burger to TGI Fridays Burger Bar menu is at the center of the brand’s commitment to innovation and reinvigorating current menu offerings. TGI Fridays initially tested The Beyond Burger at a handful of locations in October, and after an extremely successful test, The Beyond Burger is becoming the fastest test-to-table menu offering in the brand’s history. Starting today, The Beyond Burger will be featured on the TGI Fridays menu as The Beyond Meat Burger and features a 6-oz. patty seasoned, grilled and topped with white cheddar, lettuce, tomato, red onion, pickles and FridaysTM sauce to appeal to heartier appetites. The Beyond Burger patty can be substituted for any existing builds from the TGI Fridays Burger Bar menu, served on the Challah Bun or “Green Style” on crispy green lettuce leaves without cheese or FridaysTM sauce for a vegan-friendly option. TGI Fridays is joining a growing number of restaurants, hotels, colleges, sports teams and grocery stores to carry The Beyond Burger. Since May, distribution of The Beyond Burger has seen triple digit growth and is now available at more than 9,000 food service and retail outlets nationwide. The Beyond Burger is the world's only burger that looks, cooks, and tastes like ground beef from cows but is made entirely from plants, without GMOs, soy, or gluten. The Beyond Burger packs more protein and iron than beef, but with less total and saturated fat. In 1965, FridaysTM opened its first location in New York City. Fridays revolutionized the dining industry and is credited with creating the Potato Skin and popularizing the Long Island Ice Tea, among other culinary creations and cocktails. Today, there are over 900 restaurants in 60 countries which offer high quality, authentic American food and legendary drinks, served with genuine personal service. Bringing people together to socialize and celebrate the freeing and liberating spirit of "Friday" is the concept's founding premise, from which the brand promise "In Here, It's Always Friday®" was born. Find more information and participating Fridays locations by downloading our mobile app or visiting Fridays.com.